For some reasons, lots of software developers seem to have an infatuation with bacon. Don't ask me why. I used to be a developer myself and I am partial to a bacon sandwich. But some developers seem to worship the stuff. To the point that the majority of their test user names and passwords are bacon related. Or if they want to choose something different, then they'll use something sausage-related. I have a password sheet in my desk drawer at work for all the test systems our developer has worked on and every single password on it is related to a pork product. 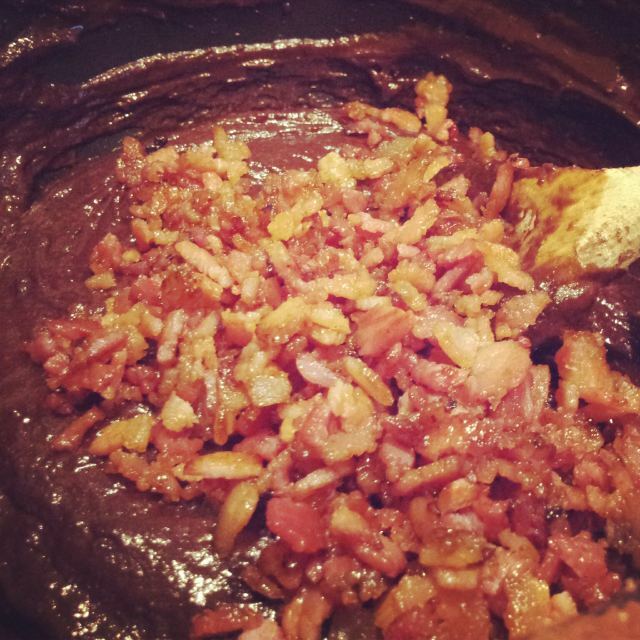 A few months ago, I came across a recipe for Bacon Jam from Not Quite Nigella. M, our developer, was having a bit of a bad time and so I promised to make him some. Of course, life got in the way and with me working at a different site for the last four months, I've not managed to keep my promise. More recently, I happened across this recipe for Bacon Brownies on Twitter and just knew I'd found a recipe that might just go down a storm with everyone. Or not. 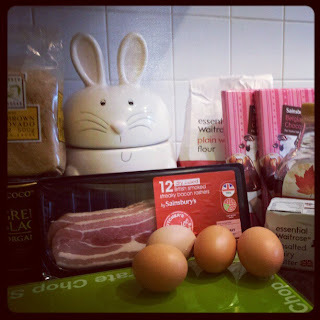 I lined up the ingredients for the first shot and wavered a little when I realised that I had the makings of bacon and eggs and I was going to potentially be wasting that as a meal option plus a whole bunch of chocolate to boot. Then I remembered my love for Canadian pancakes with crispy bacon and maple syrup and kept going. The bacon was hard to dice finely so I snipped it into tiny squares, fried it off and then chopped it up with my big cook's knife once it was a bit crispier. I substituted maple syrup for the golden syrup and, having forgotten I'd run out of bicarb, used 3 tsp of baking powder instead. There was so much chocolate in the recipe that I was worried that the bacon flavour would be lost. 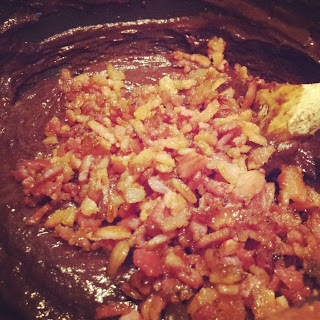 The finished brownies were beautifully soft and gooey and the salty nuggets of crisp bacon gave a wonderful contrast. I'm not sure if you'd know it was bacon in there if you weren't told up front. It could equally have just been flakes of sea salt. Being a Nigella recipe, it's the antithesis of the Guilt Free Brownies I made back in January. And of course, it's not veggie friendly. 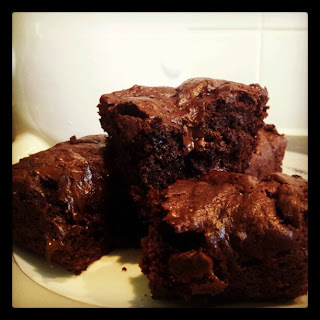 But there are plenty of other brownie recipes on this blog for my lovely veggie friends to try. If you're looking for a talking point, it's definitely one to try. You can find the recipe online at Emerald Street. Hopefully M will appreciate them. And another brownie-fearing colleague has also expressed an interest in trying one for the experience. I'll update the blog with feedback later. Oh and it'll be interesting to hear the husband's opinions too! I won't be telling him what the secret ingredient is until he's finished eating it. Update 23/04/2012 - Well the husband had a bacon brownie and was warned it contained bacon and he ate it without fuss, without gagging, without complaining. His only comment was that it was more cakey and less fudgy than my usual brownies. I am impressed! I think it was just the sheer amount of chocolate that one him over. As for M? Well he took all six home to share with his cats. I still await his verdict. 1. Preheat the oven to 190°C and get out a 25cm square tin and line it, or (as I prefer) a throwaway foil baking tray measuring 30cm x 20cm x 15cm. 2. Heat a heavy based (preferably non stick) frying pan and when warm, add the bacon bits and cook, stirring occasionally until beginning to crisp. Add the syrup, stir again to mix and transfer the sticky bacon bits to a cold surface, either on some foil or a plate. The syrupy bacon juices left behind are just delicious when mopped up with some bread: a cook’s treat! 3. Melt the butter over a gentle heat in a medium sized saucepan and when it’s melted, add the sugar, stirring with a wooden spoon. 4. Now take the pan off the heat and add the cocoa, flour, bicarbonate of soda and stir, then add the beaten eggs and stir again to mix. 5. Add the chopped dark choc or chips and the bacon bits, breaking them up with your hands if necessary. Fold together then pour and scrape into the tin. 6. Place in the oven to cook for 20-25 minutes; you want a little gooeyness inside still. 7. Transfer the tin to a wire rack and sit until cooled a little (but not to the point of coldness) and cut into 16 squares.